The private sector of the U.S. economy has created about 8 million jobs since early 2010, for an average gain of almost 180K per month. 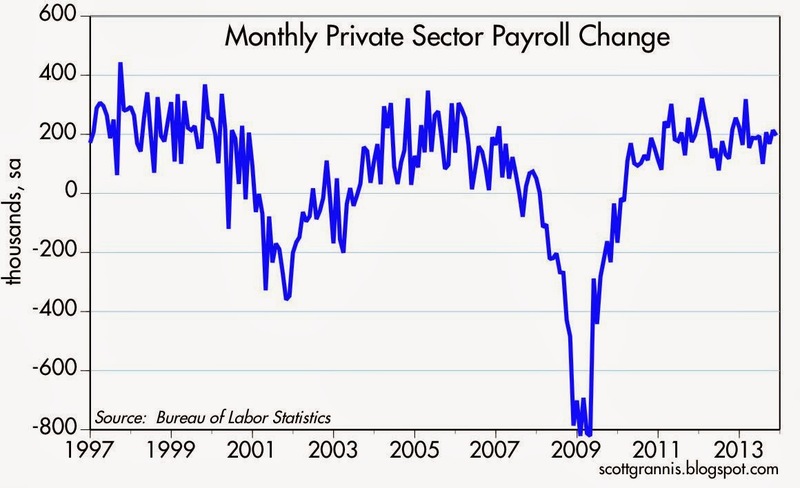 Last month it created almost 200K jobs, and in the past year private sector job gains averaged 180K per month. Jobs growth has been relatively steady at about 2% per year for almost four years now. 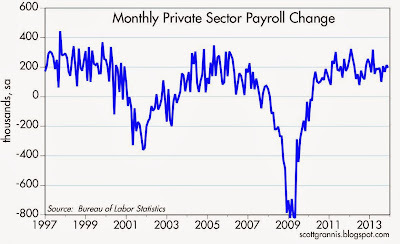 At the current pace, private sector employment will reach a new all-time high within the next 4-5 months. We'd all like to see even more new jobs, but it's time to stop bemoaning the sorry state of the economy. It's probably growing slower than it otherwise could, but it is definitely growing. I prefer to focus on jobs created in the private sector, because those are the ones that really count. After all, in the last government shutdown, our own government estimated that over 20% of the federal workforce was non-essential (in some departments the number was as high as 80-90%). 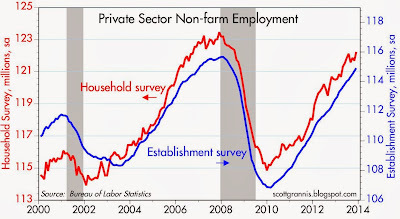 The first chart above compares the private sector workforce as measured by two different surveys. The magnitude of job creation in the current recovery is very similar to that of the previous recovery. The second chart above shows the monthly gain in private sector jobs; again, the record of the current recovery is very similar to that of the prior recovery. 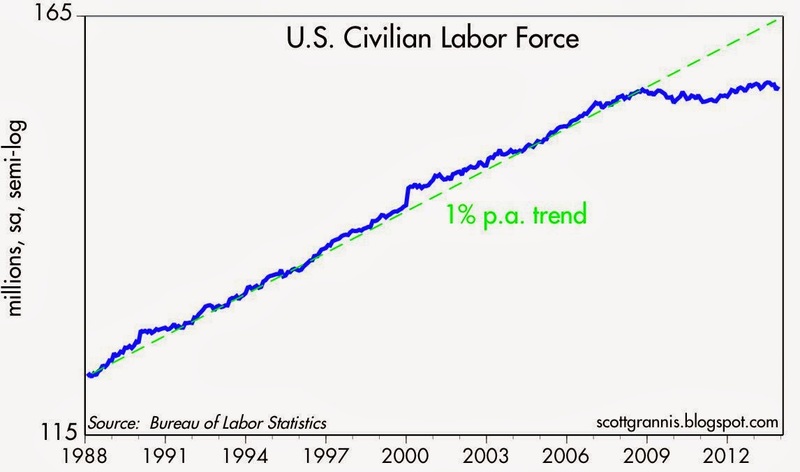 The problem that is real and unique with this recovery is the lack of growth of the labor force (defined as those who are working and those who are looking for a job). In fact, since 2008 there has been zero growth in the labor force. Ordinarily, we would have expected to see annual growth of about 1%. From a longer term perspective, we also have the problem of the decline in the labor force participation rate, which has declined from 67% in 2000 to 63% today—about 4% of the working age population has simply "dropped out." If past trends had continued, there could have been at least 10 million more jobs created by now. Is this the fault of the Fed? Can more Quantitative Easing entice millions more to go out and look for a job? Can more QE convince businesses to expand? I seriously doubt it. The economy could be a lot stronger and more prosperous, but that very likely has nothing to do with monetary policy. It's time for the Fed to taper QE now and plan on reversing it as soon as possible before something goes wrong (e.g., inflation). We won't see any dramatic improvement in the economy until fiscal policy becomes more growth-oriented and less redistribution-oriented. 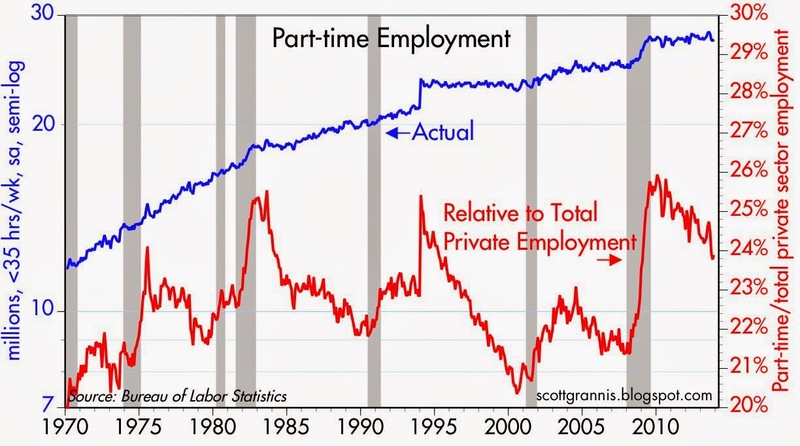 Despite what you might have heard repeated many times in the media, jobs growth in the current recovery has not been dominated by part-time jobs. 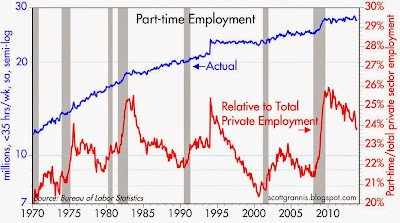 As the chart above shows, there actually has been zero growth in part-time jobs since the last recession, and the ratio of part-time to total jobs has been falling steadily, much as it has in every recession in the past. Scott - what is your take on the baby boomer demographics affecting the labor participation rate? Demographics most likely accounts for some of the decline in the labor force participation rate and the lack of growth of the labor force, but not the bulk of it. Demographics don't change fast enough to explain the changes we have seen in the labor force. The "real" unemployment rate, if you assume there are lots of people who dropped out but could be enticed back, is probably 10-11%. I agree. At first take I started to think the demographics might actually provide a favorable environment for job creation, but its complex. What is your take on the Household Survey over the past twelve months relative to the Establishment Survey. Looks to have average about 80,000 per month versus about 190,000 per month. What do you make of this apparent disconnect...one that usually does not last as long as a year. Perhaps it is an anomaly in the data series for this 12 months, but even over the entire recovery since 2010, the Household survey seems to lag by about 25,000 per month or so. The household survey is extremely volatile so month to month changes can't carry much weight. Over time the two surveys say roughly the same thing. I don't think the long-term difference is significant. Unfortunately, the employment to population ratio remains stuck at the same low levels as 2008 -- moreover, the jobs created since 2008 are not sufficient to cover the jobs required due to population increases -- I guess everyone can celebrate the recent jobs creation, but until the employment to population ratio begins to improve significantly, the stagnation in jobs as a percent of the population is a documented fact, and just more evidence of Main Street economic depression -- the good news is that the Main Street depression is creating real equity buying opportunities for accredited investors (incomes > $300,000 and net worth > $1 million) -- my advice to unaccredited investors is to do whatever you must to join the ranks of accredited investors before it is too late -- the US jobs picture is one of predictable stagnation that I believe will continue for the rest of the 21st century -- let's face it, the world has too many people and there is only so much to go around. PS: The demographic that is wiping out opportunity for everyone except those with world-class skills is population growth, which is reality -- watch for US real working wages to regress to global norms over the balance of the century. I think the smart money is on government intervention: transfer payments, welfare, food stamps, emergency unemployment, higher tax rates, Obamacare, etc. The Fed is going to look at tapering, but probably next year. The inflation numbers are still dangerously low, as in 1 percent on the PCE and falling. Very little pressure from unit labor costs, commercial rents. Energy costs flat. The problem with such low inflation rates, and a global glut of capital, is that the economy slips into the zero lower bound with any recession. Then you are right back with interest rates at zero and sluggish growth. The Fed can do nothing, and good luck in getting supply side improvements in a timely manner. Like when they say okay to an international airport in Orange County. The Fed is playing a dangerous game, with inflation so low. Further monetary stimulus, cannot help and will not help; further monetary stimulus will only strengthen the hand of the bond vigilantes who have been calling the Benchmark Interest Rate, ^TNX, higher since October 23, 2013, as the policies have crossed the rubicon of sound monetary and have made “money good” debt, and “money good” currencies, and now “money good” fiat money, that is World Stocks, VT, bad. One should dollar cost average an investment into the purchase and possession of gold bullion. Yet for those not so inclined, I recommend an investment strategy of short selling, with these market vane ETFs, seen in this Finviz Screener ... http://tinyurl.com/kd3o75c ... OFF, STPP, HDGE, XVZ, GLD, SLV, JGBS, EUO, HYHG, and SAGG, serving as the margin basis for one’s short selling program. Neither party appears to have Main Street in mind...I have to vote for gold nuts and ethanol-drunk militarists (the 'phants) or socialists (the Donks). I'm a bit confused here. 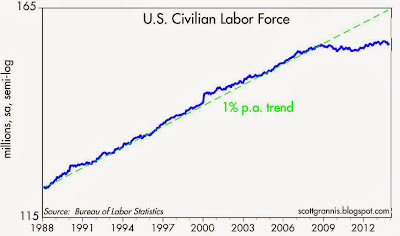 If we are creating jobs at the same rate as in the past, why is the labor force participation rate flat? Is it because the job growth is measured in absolute numbers rather than adjusted for an increasing population? "everyone needs to understand that cutting government spending is a matter of life or death for the USA -- Federal spending must be cut by at least 40% immediately just to balance the budget"
A tax and regulation (especially EPA) holiday for 3-5 years is a great idea. We (our govt) need to leave things alone for awhile and stop the changes - it causes too much uncertainty..
Govt intervention is way out of control.